I don’t have any foreign friends. Technically, I do have some but I only met them online – an Italian girl with the same music interests as I do and a Puerto Rican guy who is into the same books I like. I also had some Korean students in Manila. I used to go to their houses to teach them English but my relationship with them was solely that of a teacher-student. One time last year, I was hanging out in Powerbooks Greenbelt (R.I.P. Powerbooks, you were one of the good ones) waiting for the rain to stop when a Chinese girl started talking to me. I could not remember how the conversation started. She was nice and we ended up exchanging digits. She told me that she had been staying in Manila for a few months to study English. Before we parted, I promised that I would maybe tour her in some places. We ended up meeting two more times after our chance encounter. I brought her to Ayala Museum because they have a gold collection from precolonial Philippines which never fails to impress. An Ayala Museum ticket can be quite costly but in my case I have a membership card which entitles me for unlimited visits with one companion. Art can be confounding to some people especially abstract art but luckily some works by Filipino children’s book illustrators were on display on our visit. The works were beautiful, cute, and not alienating for art newbies. She was amazed with the gold collection and she liked the illustrations and artworks on display far too much that she stood frighteningly close to them. I think Ayala Museum is a safe bet when touring a foreigner in Manila. It has great security and it has air-conditioning in all rooms. It is huddled in between Greenbelt and Glorietta malls; your foreign friend can also have a taste of the mall culture here (because what is Manila without its malls? 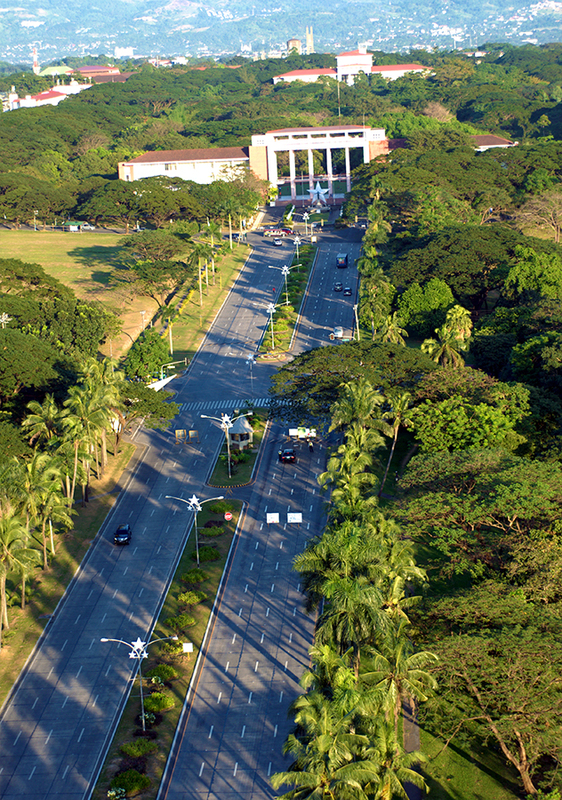 more green spaces maybe huhu ). I was surprised with the overwhelming reaction she had when I took her to UP. There are green spaces in Manila but there are only so few of them; after all, Metro Manila is a city of huge shopping malls. She could not believe that there is such a place with old and huge trees hidden somewhere in the city. Her reaction simultaneously made me proud (as someone who studied in UP, I am very proud of our campus) and sad. She told me that while living in Manila had been fun, she missed hanging out in parks. In China, she used to take long walks and read in parks. I told her that she is staying in Makati and pointed out that it has several parks; she herself has told me that she sometimes hung out in Ayala Triangle gardens. She looked at me, almost with pity, and said “those are not parks, they are so small”. Granted, the parks in Makati are still parks regardless of the size; and it’s not that fair to compare parks in the Philippines with those in China because their country is freaking huge. Still, her comment saddens me because I know that there is some truth in that; green and open spaces in the metro are so few and most of them are managed by private organizations (e.g. Ayala Triangle, Nuvali (which is in Laguna and not Manila), La Mesa Eco Park). Filipinos, all things considered, are good people. Since the new administration took over, I began to have less faith in us as a people (how could we allow all this bloodshed with an ever increasing body count to happen 😦 ?). Now, I’m remembering what my friend said about us. She told me that she and her Chinese classmates were so surprised that Filipinos were very nice to them and that they all agreed that we are good people. Knowing someone on a personal level can lessen one’s prejudice. I have a lot of feelings about China mainly because of the territorial conflicts we’ve had with them for years now. But, meeting my friend, made me realize that their government is different from their people. Also, generalizations are stupid, because not everyone from the same country or religion, are the same. Salary in the Phillipines is really low. My friend told me that one thing she was shocked to discover was our low salary. Again, it’s unfair to compare because their economy is different from ours and has a different cost of living; still this is saddening. This is why many Filipinos leave their families and risk abuse just to work abroad (my father used to work in Saudi so he missed my childhood). She advised me to just go to her city in China and teach English (I was given the same advice quite recently by one of my Brazilian students, something I am seriously considering). Metro Manila is polluted and has poor garbage management but at least our sky is clear. My friend said that although there is air pollution here, it is vehicular so it does not reaches up to the sky. Thus, we can still enjoy a sky with varying hues of blue and white (China has been plagued with extreme cases of air pollution lately). Having said that, pollution in Manila should still be solved no matter how blue our sky remains to be. Touring a foreigner can be fun and makes me see my city from a different viewpoint. It is also a cheap way of knowing about another culture. I don’t have money yet to travel abroad but my friend’s stories helped me discover a part of her culture. She flew back to China a few weeks after we visited UP. Had we had more time, I would have taken her to Aguinaldo Museum, Paco Park, the National Museum, or maybe Tagaytay. Hopefully, I can have another chance encounter with a foreign tourist whom I can show around my city.